Texas Public Radio (TPR) operates seven non-commercial radio stations. KPAC 88.3 FM and KSTX 89.1 FM broadcast to San Antonio and South Central Texas, KTXI 90.1 FM, broadcasting to the West Central Hill Country, KTPR 89.9 FM, broadcasting to Snyder and the Big Country, KVHL 91.7 FM, broadcasting to the Highland Lakes region, KTPD 89.3 FM, broadcasting to Del Rio, and KCTI 1450 AM, broadcasting to Gonzales area. Texas Public Radio was organized in 1988 and formally incorporated as a 501(c)3 non-profit organization the following year. It grew out of a merger of two separate organizations, the Classical Broadcasting Society of San Antonio and San Antonio Community Radio. Its name was chosen anticipating eventual expansion of service to listeners throughout the state. It is an independent, non-profit organization governed by a Board of Directors composed of residents from the service area. KPAC has specialized in broadcasting classical music and fine arts information since November 7, 1982. The programming includes special concert series such as the "San Antonio Symphony on KPAC" and "Performance Saturday." KPAC is listened to regularly by as many as 100,000 people. Since going on the air on October 3, 1988, KSTX has been the home of NPR's flagship news magazines All Things Considered and Morning Edition. Foreign perspective on news-making events is offered in the overnight broadcast of the BBC World Service. Entertainment programs on weekends include such public radio favorites as Ask Me Another and Wait Wait... Don't Tell Me. More than 120,000 people listen regularly to KSTX. In 1998 Texas Public Radio added a third station to the family. KTXI signed on October 8, 1998 and serves listeners in the Hill Country with select programs from the KPAC and KSTX schedules. On January 20, 2013, KTPR 89.9 FM began broadcasting NPR news and information to the Texas Big Country – Snyder, Big Spring, and Sweetwater. On October 21, 2013, KVHL 91.7 signed on, broadcasting to Llano, Texas, and the Highland Lakes region, and on May 5, 2016, KTPD 89.3 began broadcasting in Del Rio, Texas. KCTI 1450 Gonzales originally went on the air in 1947, but became a part of the TPR family of stations on September 28, 2016. In 1988 San Antonio was the last large community in the country where listeners could not find the full range of public radio programming on their radios – a deficiency especially deplored by new residents who had become accustomed to listening to public radio in other places. There was no service at all for listeners in the West Central Hill Country. Now San Antonio, the Hill Country, the Highland Lakes and the Big Country are among the best places in the world to listen to the best that public radio has to offer in presentation of great musical art, in-depth news, civil discourse about issues and educational entertainment. We are proud of this significant accomplishment. Our pride is heightened every day when listeners and supporters tell us our programs make a major difference in their lives. 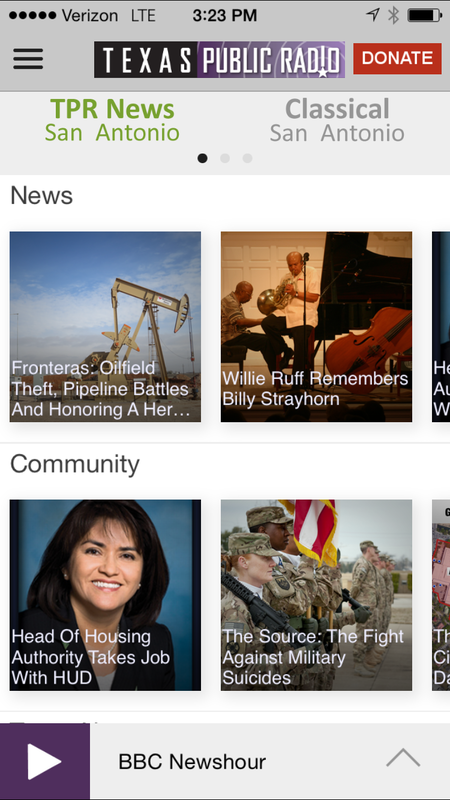 Stay connected with Texas Public Radio and other public media organizations anytime, anywhere with our mobile apps. Listen to live streams of your favorite public radio programs through your Android, iPhone or iPod Touch. Download the apps today to listen to the best public radio has to offer whenever and wherever you want. The MISSION of Texas Public Radio is to engage in the production and distribution of non-commercial informational, educational, cultural and entertainment content for the people of Texas. Content will be guided by the shared interests of the membership and users of Texas Public Radio media, while adhering to the highest standards of responsible journalism and the values of Texas Public Radio.